SCROLL DOWN to see lots of Inexpensive baseball wallets to the moderately priced leather Baseball Wallet with Your Name and Number are available for every design. Go under “More” by Style to change the baseball wallet style and price. Personalized Vintage Leather Baseball Wallet gifts, the perfect Baseball Gift for players, coaches and the avid baseball fan. Vintage Baseball Gifts, so many great Baseball Gifts ideas to choose from. Baseball Team Gift Ideas for birthday, at the start or end of season. Personalized Baseball Wallet with YOUR NAME and NUMBER. Encourage savings too. End of baseball season gifts for baseball players and baseball team gift ideas for seniors. Really cool gift ideas that makes the perfect Baseball Gifts for guys. Printing Processing in 3 – 4 Business Days plus Shipping Time. Cheap Nylon Vintage Baseball Wallets or Choose the Faux or Real Baseball Leather Wallets for Guys or Denim in many sizes, styles and colors. On the product page for the Baseball Wallet, look to your right (on a computer, below on some other devices). Use the Text Box Templates to Type in YOUR TEXT. Click “More” if you don’t see all the text box templates below “Customize”. Type in the Baseball Team Name, Baseball Players Name, a favorite saying or just Highlight the Temporary Text and DELETE IT. He will enjoy one of these Personalize Genuine Custom Leather Baseball Wallets for Men. Really cool Baseball Gifts for Boyfriend with outstanding printing, makes a wonderful Baseball Gifts, Birthday Presents for Teenagers and Men or how about celebrating the beginning or end of the baseball season. Makes the perfect baseball gift for that very special person. Customizable Baseball Wallet with Your Name and Number. Vintage baseball wallets for baseball boyfriend on their Birthdays, Christmas, Valentines day or to celebrate the end of baseball season. Really cool baseball gifts, makes the perfect Personalized Baseball Team Gift Ideas. Personalize ONE at a time, Add to Cart then Return to personalize the next baseball wallet. These cheap baseball gifts for boys and men are very affordable and inexpensive. Give a memory this baseball season, their own Baseball Wallet with Your Number and Name. Some of the coolest Personalized Baseball Wallet with Your Name and Number, makes the perfect Baseball Gifts ideas for any occasion. If you prefer not to have any text on your baseball wallets, this is a nice choice. Choose from many different wallet styles including real Custom Affordable Nylon Baseball Wallets or choose the Real Leather Wallets for Men and Boys, Denim, Nylon etc. Price points for every budget. They will love one of these Baseball Wallet with YOUR NAME and NUMBER. Many girls wonder where and what type of cute things to get their boyfriend. First, I just want to mention that guys don’t like cute things they like grunge dirty old vintage look things. I have 4 brothers who used to rub their brand new sneakers in the dirt before they would wear them. Years later, Grunge and Dirt is where it’s at for gifts ideas for guys. Our dirty baseball design has really taken off. Even mom’s ordering for their son love this design. You can find personalized baseball gifts for under $5.00 to over $100.00. The newer your relationship is with your new boyfriend, the less you should spend. I would recommend talking about it ahead of time and deciding how much to spend on boyfriend and girlfriend. They will enjoy this Baseball Wallet with YOUR NAME and NUMBER on it. How much to Spend on a Gift for Boyfriend? For a new boyfriend, I would recommend spending between Free, something that you made and $20.00. This will depend on your budget, how old you both are and how long you have been dating. If you spend too much, you will look too serious and it may make him want to back off. To avoid awkward moments, talk about it ahead of time how much to spend on boyfriend and girlfriend gifts and then seriously stick to the agreement. When one person spends way more then the other, someone is bound to feel bad. Cheap Baseball Wallets is a nice medium priced and affordable gift for new boyfriend. They will love and cherish their Baseball Wallet with Your Name and Number. We will create your gifts for baseball players, coaches, parents for many other sports, too. Can Owning a Wallet Inspire Kids to Save Money? 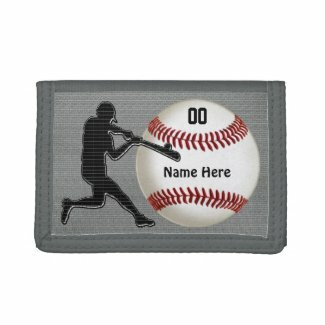 Baseball Wallets from Zazzle with various creations by different designers. Zazzle prints the designs on the quality products with their amazing robots for Vibrant Detailed Printing “Second to None”. You can pick any style wallet that the design fits nicely on in the “Style Options” area. So many Baseball Wallet designs and styles of Personalized Wallets for Men, Women and Children. Make it special with a Great gift idea that are Personalized Baseball Wallet with YOUR NUMBER and NAME. Will owning a Wallet, you can help teach your kids to save money. My Six Year Old Grandson won a very cheap wallet from an amusement park. He started saving money right away and a year later saved $50.00 in his wallet. The only problem with this was, he took it with him and a six year old is not old enough to be running around with $50.00 in his wallet outside of the home. He did chores and worked hard for this money to be able to buy something special for himself so it was a huge disappointment to have lost it. There is still hope though. They moved recently and it might be in one of the boxes. My daughter and son-in-law are offering him extra chores and ways to earn back that money. If they just replaced it, it wouldn’t teach him to be more careful with his belongings. He will likely remember this incident for the rest of his life. Moral of the story is this: I think getting a wallet for young children is a great idea. I have always believed in teaching my kids about money and saving money and tithing a portion for the Lord, but don’t let the amount of money build up too much in the wallet. Have fun putting that earned money and gifts into a Piggy Bank at home or opening an account for your child at the bank. Take them with you and have them become part of the process of opening up their very first bank account. 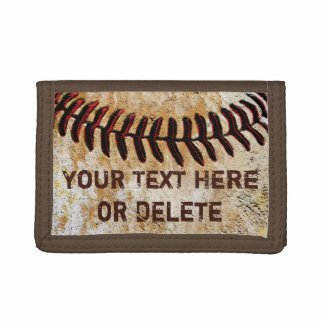 Baseball Wallet from Zazzle with Amazing printing quality. Call Linda if you would like a different design or any changes to any of our designs. There is no extra charge. We just love making personalization gifts that you and your friends and family will just love. It makes it extra special with their favorite Baseball Wallet with YOUR NAME and NUMBER. Thank you for coming to YourSportsGifts.com and visiting our Baseball Wallet article. Makes the perfect Baseball gifts idea that are Personalized Baseball Gifts for Teenagers, Boys and Men. Baseball gift that they will treasure for a life time. Personalized Baseball Wallet with their Name and Number, a great gift idea for that special sports fan. Thank you for checking out our Baseball Wallet with Your Name and Number. Customizable Baseball Wallet, the perfect Baseball Gifts. All Baseball Wallets are available in several styles, colors and materials. From Cheap Baseball Wallets to more expensive Baseball Leather Wallets for Men and Boys. These are the designs my wife, Linda created for Dad and Son matching Shirts. You can buy the same design by personalizing, choosing the size, style and color of Dad’s shirt first then ADD to CART and Go Back and Choose a Kids shirt style, color, size and personalize his shirt. Easy way to buy Dad and Son matching shirts with baseball design. God Bless and Thank you for viewing our Personalized Baseball Wallets designs. CALL or TEXT Linda if you would like to make changes or have her customize personalized baseball gifts for you.